Dave and I have spent our lives in Nestor Falls–and both of our families are from Northern Ontario. With so many years of history here, you can bet we’ve got good stories. In the mid-1930s, David’s grandparents, Fred and Irene Beaushene, lived on what’s known today as Caliper Lake. 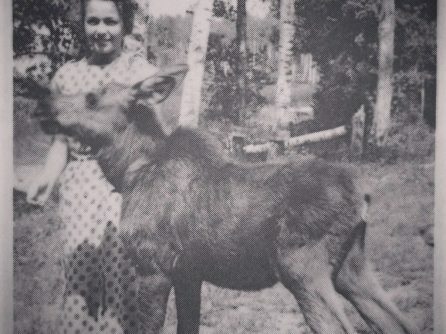 Fred and Irene adopted an orphaned baby moose, named her “Dixie,” and raised her on a bottle. Dixie attracted many passersby–and was even photographed by brave admirers. 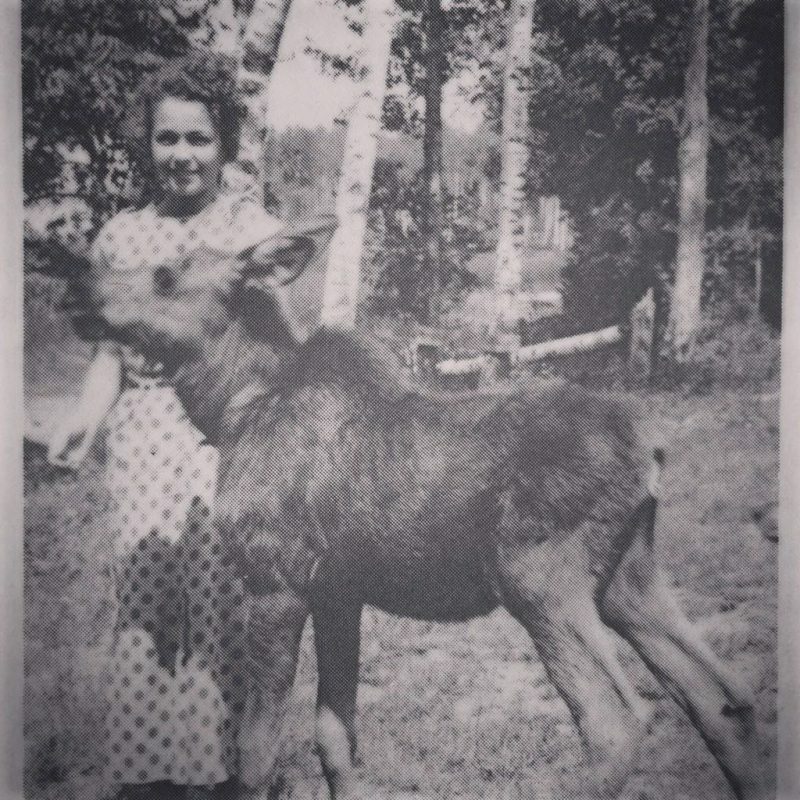 During hunting season, Irene had the moose wear a bright red neckerchief. By the age of two, Dixie was VERY large, but seldom wandered far from the cabin. In fact, she’d try to make her way into the kitchen if the door was open. One evening, Fred had a couple hunters visiting, and moose calls came up in the conversation. He said very nonchalantly that he could call moose. The hunters bet him that he couldn’t and laid their money on the table. Fred loved to play jokes, so he covered the bet, walked to the door, and called, “Here Dixie!” To the surprise of the astounded hunters, in walked Dixie. Fred collected on the bet, which he said helped defray the expense of all the canned milk she consumed during her baby years. In time, Dixie left Fred and Irene’s cabin, probably to fall in love and live with other moose in the wild. If you’re looking for another story during a visit to Nestor Falls, we’d happy to share a tale or two!